Beginning early the morning of October 13th, 1901, the fire razed 60 establishments, including a stable and its eight equine occupants. 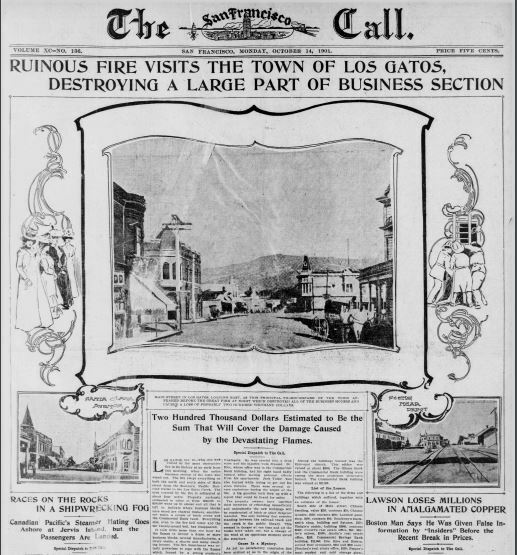 As one newspaper stated, “The entire business section of the town was wiped out” . It attacked shops, factories, a church, homes, and anything in its path as dry conditions and wind sped it leaping from one building to the next. Many were injured by flame or one of the numerous explosions. The firemen of all three companies worked hard and were successful at saving the bridge – a great and important feat for the town. Many photos were taken after the fire, showing debris and what little still stood, such as the vault in the bank. Many business owners chose to rebuild with fire retardant material, such as brick, after the disaster. The source of the fire was never determined. The next largest conflagration after 1901 happened on July 5th of 1943 which burnt two buildings to the ground on main street, including Palmer Perkins Stoves and Tinware – one of the few survivors of the 1891 fire. In 1947 the Santa Clara County Fire Department (SCCFD)was established to service the unincorporated areas in the county and also a number of county communities including Los Gatos, Monte Sereno, and Saratoga. The SCCFD not only fights fires but also provides emergency medical attention. In 1956, one of Los Gatos’ icons was scorched – Billy Jones’ engine house. Many of Billy Jones’ original railroad paraphernalia were destroyed or damaged in the fire – likely caused by faulty wiring and oily rags throughout the building. The original locomotive engine was saved, and afterwards major volunteer efforts were made to rebuild the railroad to its full functioning glory. What many Los Gatans recognize as the old Los Gatos Art Museum (1 Tait Ave) is actually the first Fire House, built in 1926. In 1962, a vote passed to allow for the funding for a new fire station. Construction on the location at 306 University Ave was completed in 1964 and is still in use today. By 1967 the old firehouse was converted into the Los Gatos Art Museum and was home to many galleries until 2015, when the art and history museums were merged to form NUMU at their new location on Main Street. The building is currently not in use while the town council decides its next occupation. Today, the SCCFD provides more to our community than ever – from firefighting and emergency medical service to community education, fire prevention, investigation (arson and explosion), special operations task force (who respond to emergencies that are out of the ordinary, such as difficult rescues and hazardous materials), and honor guard. We are very proud of our fire department and will be thinking of them as we enter into another dry hot season.